If you are hesitating when it comes to content marketing these statistics will provide some motivation. Most businesses will have heard of content or inbound marketing and recognise that it is a great way to reach out to their potential and existing customers on-line however it takes some commitment and planning to get started. If you are still on the sidelines or struggling to to get a strategy for compelling engaging content in place this list will give you reasons to move on. The Corporate Executive Board says that nowadays almost 60% of the buyer ‘journey’ is completed before they reach out to the vendor: most buyers will previously have researched and be well- informed from digesting content, before contacting vendors that they intend to buy from. Demand Metric says that 78% of CMOs think content is the future of marketing. There is widespread acknowledgement that content marketing is here to stay, even if there’s not yet a widespread understanding of how to get the most out of it. The same organisation reports that content marketing costs 62% less than traditional marketing and generates about 3 times as many leads. Few businesses can afford to ignore such an attractive marketing ROI. Google reports that the number of web searches for “Content Marketing” has increased 400% since January 2011 – as sure sign of the buzz we mentioned earlier. Aberdeen reports that conversion rates for brands using content marketing is 6 to 7 times higher than for those that don’t. Content+ says that one of the main reasons that people follow businesses/brands on social media is the interesting content that they generate. What do businesses list as the biggest challenges to creating content? According to Robert Rose it’s the following: Lack of time (30%), inability to create enough content (11%), and inability to create engaging content (11%). What are the biggest complaints that B2B buyers have about content from vendors? According to Social Media Today, first is too many requirements for downloading; second is blatantly promotional and self-serving content; and third is non-substantive, uninformed content. So avoid these boo-boos when you come to design your content strategy. Altimeter reports that 57% of digital marketers define content marketing as their number one priority. Thanks to Toby Marshall at www.leadcreation.com.au for compiling this list. 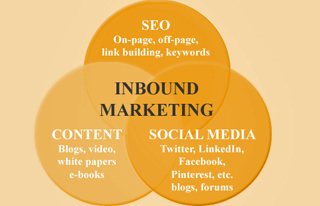 Inbound marketing works so its worth doing well. If you would like some help in getting you inbound strategy up and running or would like some extra resource please get in touch. H P Consulting can offer you affordable help.